Many people are motivated to lose weight so that they will feel happier and more confident about their appearance. Setting healthy weight loss goals is a great first step towards feeling better about the way you look. A weight loss program in Chattanooga can create a customized diet and exercise plan for you that helps you achieve a natural weight loss. Weight loss companies will also screen you for medical problems that may be preventing you from meeting your weight loss goals and feeling happy about your appearance. Hormonal imbalance and weight gain go hand in hand, and your doctor may need to address your medical issues before you can begin losing weight. The most important things to consider when trying to lose weight are your health and happiness. A safe, healthy weight loss program should focus setting weight loss goals that will improve your overall health, and help you develop a more positive self-image. If you are only trying to lose weight because you’re worried about other people’s perceptions of you, you may not be as successful as you would be if you were focused more on your own desires and needs. The thyroid gland produces hormones that regulate almost all of the body’s metabolic processes. Thyroid problems can cause a number of different issues, including goiters, cancer, hyperthyroidism, and hypothyroidism. Many thyroid issues also lead to weight gain, or difficulty losing weight. If you believe that you may suffer from a hormonal imbalance and weight gain has become an issue for you, join a weight loss program in Chattanooga for help. Hypothyroidism, or having an underactive thyroid, often results in a very low metabolism. This can cause those suffering from hypothyroidism to gain weight, or to have difficulty losing weight. Even if you’re trying to achieve a healthy weight loss via a balanced diet and exercise, a thyroid issue can still cause you to gain weight. Your doctor can do thyroid testing to determine if you have a thyroid issue. Once you begin treating the underlying cause of your weight gain, you may experience a natural weight loss. If you’ve noticed that your face has become puffy, your muscles feel weak, achy, and stiff, and you have swelling and stiffness in your joints, you may be suffering from a thyroid issue. If your thyroid issue isn’t treated, these symptoms will become more and more severe. These symptoms may also discourage you from exercising or preparing healthy meals, which will also affect your ability to meet your weight loss goals. The hormone imbalance in your body that results from thyroid issues can make you feel very fatigued and listless. It can also slow your heart rate, lower your blood pressure, and impact your breathing. This influx of hormones can also make you feel more forgetful, slow down your cognitive processes, and make you feel depressed. If you have been trying to lose weight, a hormone imbalance can not only cause weight gain, but it can also make you feel so tired and depressed that you lose interest in being active and healthy. Thinking about the entire amount of weight that you want to lose can make weight loss seem overwhelming and impossible. Creating safe, healthy weight loss goals for yourself can help you stay motivated when you’re trying to lose weight. It will be much easier for you to lose weight if you join a weight loss program in Chattanooga, because weight loss experts will encourage you to set weight loss goals, and will then help you meet them. Watch this video to learn how to set weight loss goals that will motivate you. Jani Roberts, a personal trainer, discusses the value of weight loss goals and advises you on how to create successful ones. Think about it—in the Chattanooga, TN area, we have lots of fertile farmland, which translates to garden land for us suburban dwellers. If you decide to start a garden, you are forced to be outside on a weekly (if not daily) basis, tending the plants, harvesting, weeding, and watering. But how does that affect your health? You might be surprised. Being outside for lengths of time is good for you in itself—the sun promotes vitamin D, fresh air rejuvenates your body—but gardening adds a little extra. Let’s look at what that extra is. There are lots of studies out there proving that gardening reduces stress, but how does it work? For one thing, sun exposure. This blog article highlights the fact that exposure to sunlight increases the production of serotonin in the brain, which is a feel-good chemical that helps us relax. It also promotes melatonin, the sleep hormone. Gardening also provides us with an attention focus that does not take any effort, unlike cell phones and TVs and laptops. Getting outside and launching into the rhythmic exercise of weeding in your Chattanooga garden, for example, allows your mind to wander while your hands perform a task that is satisfying (removal of weeds automatically produces a clean garden). Giving your brain a break from the norms of being inside will definitely lower your stress level. And gardening doesn’t just relieve stress. It also helps with mental disorders like depression and anxiety because it is scientifically mood lifting. 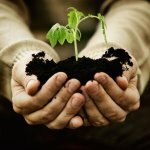 We learn in this Permaculture Research Institute article that the harmless bacteria M.vaccae found in soil actually promotes the production of serotonin, which elevates your mood. That in combination with sunlight is sure to boost your mental health! 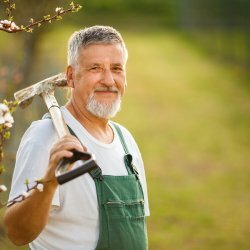 In the same article, we see other studies that prove that gardening produces a positive mental outlook, happiness, and even prevents dementia in seniors. Need a mood-lifter? Go outside and tend your Chattanooga garden. Want to keep dementia from stealing your twilight years? Get a garden going next spring. And finally, the most obvious health benefit of gardening is the products of it. When you grow vegetables, everyone in your household benefits. Home-grown vegetables are usually organic and quite fresh, making them even better than the produce that you can pick up at the grocery store. And you can grow quite a lot of different vegetables in the Chattanooga area that your Chattanooga, TN chiropractor will love. Check out this planting schedule to find out when you should plant foods like asparagus, broccoli, cabbage, carrots, cauliflower, okra, squash, and sweet potatoes. And if you still don’t believe us, read the proof in this US News article . 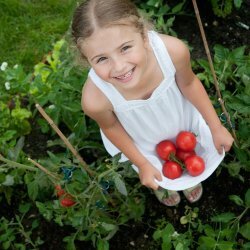 Growing your own veg is one of the healthiest things you can do for your family’s diet. So by now, we hope that if you’re a Chattanooga, TN chiropractor patient—or even if you’re not—you see why gardening is one of the best activities you can do for your health. You can read about more benefits here if you’re still not convinced. Make gardening your go-to move when you’re stressed out or sad. Do you have your own garden? Or maybe you’ve been thinking about it, and we’ve just tipped you in the right direction. Tell us about it! We want to know how our readers are reacting to our blogs, so leave a comment in the box below. A rapid weight gain or an excess of body fat can cause many health problems. In fact, the longer you remain overweight, the more likely you are to develop certain serious health issues, such as heart disease, high blood pressure, and diabetes. A weight loss company near Chattanooga can help you achieve safe, healthy weight loss goals. This will dramatically decrease your risk of disease or illness. As your weight increases, so does your risk of developing heart disease. Cardiac heart disease is caused a waxy substance called plaque building up in your arteries. These arteries are used to supply blood to your heart, and when they become narrower due to plaque buildup, the blood flow to the heart is reduced. The result is a condition called angina, during which you may experience chest pain or discomfort. Obesity can also lead to heart failure, because your heart will eventually not be able to pump enough blood through the body. Blood pressure is a measure of the force exhibited by the blood as it pushes against your artery walls while the heart pumps blood. Being overweight or obese is one of the leading causes of high blood pressure. If you have high blood pressure, the force of the blood hitting your artery walls is very high, and this can eventually cause stress to the heart, and heart disease. High blood pressure is also exacerbated by plaque buildup in the arteries, as narrower arteries create more of a resistance to blood flow. The buildup of plaque in your arteries that results in coronary heart disease can also lead to a stroke. Without treatment, the plaque in your arteries may eventually rupture and form a blood clot. If the blood clot travels to your brain, it will block the flow of blood to your brain, causing a stroke. Your risk of having a stroke increases with weight gain. The best way to lower your stroke risk is to lose weight through a healthy weight loss program.